If you’ve been coming to our office for awhile, then you already know that we’ve been making some decor changes around here. Granted, it has been a slow-work-in-progress that actually started during last summer (well, last year’s summer that is). It was during one of our customer service team meetings, that we decided it was time for an office makeover! 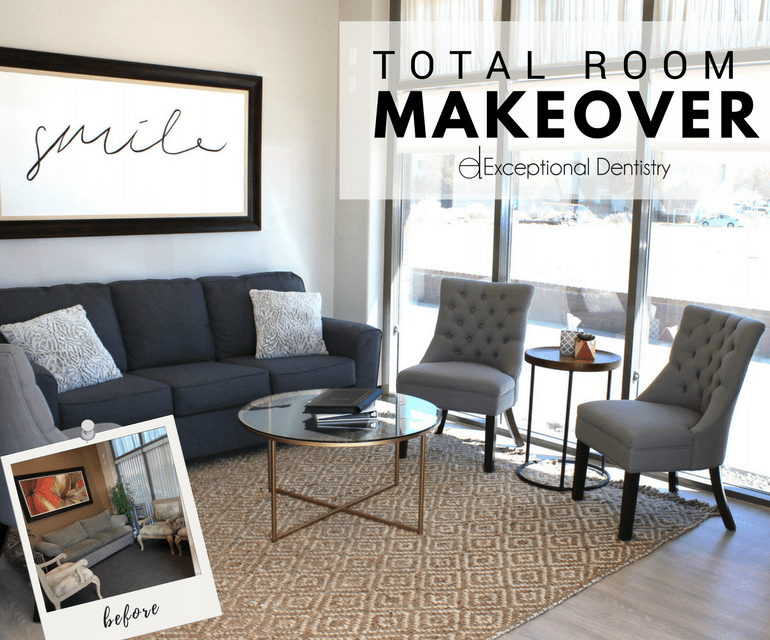 The brown-beige walls and dated decor, wasn’t our style anymore, and it definitely didn’t generate the bright and welcoming feeling we wanted for our patients. Our goal was to have our office feel like your home away from home. We have a dream of you coming in, getting comfy, and kicking back to relax. And so it began! Let’s refresh your memory with some before pictures of how the reception area was. The first thing that needed to be done was the removal of that pony wall. The previous office tenant had put it in. We think it was intended as a kids area, but the room was already small to begin with so that wall just made it feel even tighter. Dr. Powell and his wife, Peggy, aren’t afraid of a little DIY, and they took out the wall in the matter of a weekend. Just by simply taking that wall out, the room felt much more open and welcoming. They also set up the new sleek side board for the beverage bar! Since we were doing this revamp on a weekend-by-weekend basis we had to split the demolition into two weekends. So we bargained shopped and found some beautiful light gray laminate flooring on clearance over at a local flooring company (they are super great over there at Metro Floors FYI, and they did a lovely job). Once again, Dr. Powell and Peggy were back at it! They removed the carpet and the glue so that the floors were prepped for installation. The fellas over at Metro finished up the job, and things were already coming together. The next thing to do was paint! If you’ve ever done any painting then you know how challenging it can be just to find the perfect paint color—boy, oh boy. You understand the dilemma of not wanting to end up with anything too dark or with too much of the wrong undertone. It felt like a hundred paint samples were looked at, but eventually the decision was made. And we think Peggy nailed the serenity and calm that we were going for. She chose a light gray (called Filtered Shade by Valspar), but first had to Kilz (aka white-out) all the walls in order to ensure that the beige didn’t affect our new gray color. After a full weekend of painting, the walls were finally done. The final part of the reception makeover, was of course, updating the decor! Peggy and Dr. Powell’s daughter, Kendra, carefully planned out the esthetic. They decided that modern finishes, with touches of natural accents would give the pristine but homey feeling we were after. And so the decor hunting began! We also swapped out the old vertical blinds for new modern shades. The “new” smile picture above the couch is a real statement piece. It was hand painted over the old orange floral one. Even though this makeover took quite a bit of time, it was definitely worth the wait. We’re so in love with this space, and we hope you’ve had your chance to come in & get comfy! If you’d love to see more after pictures check out our office tour. What’s your favorite part of the room? We’d love to hear from you! P.S. Stay tuned to see our other office updates. Keep on smiling.